Ah, watercolor! It brings me back to the days when I sucked at art but loved it all the time. And it was so easy to get off your hands and clothes (and unfortunately the paper, too). Well it turns out that it is a legitimate art medium. But, are those fancy tubes really necessary? Can’t we just use the same old Prang tray that we used when we were kids? Well, you can, but they’re much harder to use. 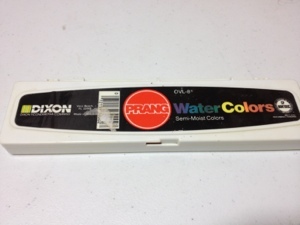 For starters they are completely solid, meaning that the water necessary to use them is much greater and the colors will still appear washed out on the paper. And of course there are the standard problems with working with water color to deal with. The colors themselves are the standard bright, crayola-type colors that every “children’s” art supply set comes in. 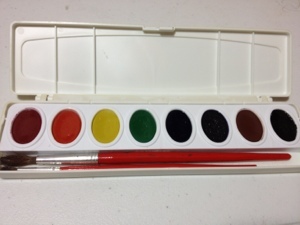 However, with them being water based paints they are much easier to blend and tone down than many other art supplies. Realism is still hard to achieve, though. The colors also have a tendency to be sticky and/ or runny, never quite balancing. The brushes are okay but definitely the worst part of the set, being cheap and imprecise. Better brushes or better yet foam pads are necessary. All in all, I think getting better paints would be a necessity for any serious work as the paints are hard to work with. At the least better brushes. But they are serviceable paints and will get the job done in most cases and in the hands of an experienced painter, nearly all cases.